Summer Temps are Cooling but Sun Lakes Real Estate is Strong! Sun Lakes home real estate market statistics will show strong favor to a seller. Nationally, home equity values have risen, with California homeowners seeing a $49,000 gain. Arizona has a gain of $25,000 year over year according to the REALTOR Magaine published by the National Association of Realtors. But, what about Sun Lakes in Arizona? We will get to that, but expect to see a gain in appreciation over last year. First, let’s take a look at the Cromford Index. As, Realtors whose job it is to constantly watch the real estate market, we have a paid subscription to The Cromford Report, an entity who analyzes real estate valley wide on a daily basis. The Cromford Index measures the strength of a buyer or sell market. An index of 100 is neutral and favors neither buyer or seller. It is balanced. The higher the number above 100 the stronger the market is for a seller. Conversely, the lower the number is below 100 shows the strength of the buyer market. The strongest seller market we have seen in a while was in 2013 when the index reached 369. 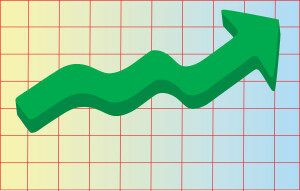 September 20, 2018 showed an index of 273.5 compared to 2017 at 155.4. That will give you an indication of the strength of the seller market in Sun Lakes Arizona. The index has touched the 2013 index as it began to fall. Listings are sparse and buyers are ready to buy! The Sun Lakes home real estate market is strong! The annual median sales price for homes in Sun Lakes is $305,000 as of September 6, 2018. That is up from $270,000 the same time in 2017 and up from $251,875 in 2015. Sun Lakes has experienced an 11% increase in home value in 2018 through September 22. That includes all homes in the five Sun Lakes communities. 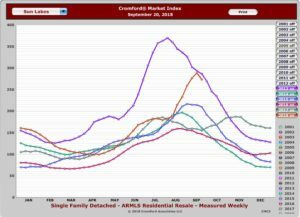 That strong appreciation coupled with the strong Cromford Index is most favorable for sellers to list their homes. But don’t wait to long. We have experienced appreciation for several years and we know that the real estate market cycles. No one knows for sure when we will start to shift, but predictions are 2019 to early 2020. Get a free market analysis of your Sun Lakes home to find out your current value.